One by one, the Peoria high school students deferentially approached the cadaver they were studying Friday as part of Grand Canyon University’s STEM Scholars program. 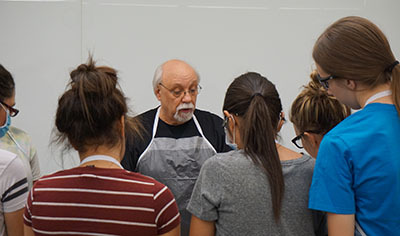 Students in the Medical, Engineering and Technical (MET) Professional Academy listen as Dr. Richard Holzer, a GCU adjunct faculty member and MET Academy biology teacher, familiarizes them with a cadaver. Blinking their eyes behind lab glasses and breathing through blue paper masks, the students from the Medical, Engineering and Technology (MET) Professional Academy were at first tentative about their unusual laboratory experiment. Their task was to locate and identify vital organs in the chest cavity. 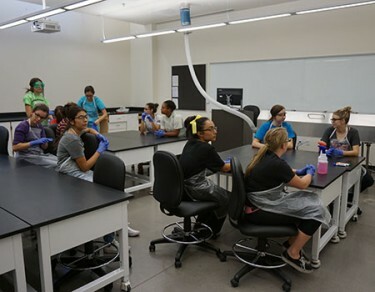 The 25 MET students were the first STEM Scholars to have a hands-on lesson in anatomy in one of three cadaver labs in the University’s new engineering building, said Dr. Michele Sioredas, GCU program manager of institutional effectiveness. They will spend two hours a month in the lab, and earn free college credits for the course. The teenagers belong to one of the inaugural cohorts in STEM Scholars, a new college-credit program that GCU President Brian Mueller announced last year to develop students for the workforce for years to come. It enables qualified (3.25 GPA or higher) high school juniors and seniors who are focused on math and science to earn up to 32 credit hours and finish their first year of college, at little or no expense to them, while still in high school. STEM Scholars tuition is free for high school students who are eligible for the federal free-and-reduced lunch program. Others pay just $50 per credit hour. 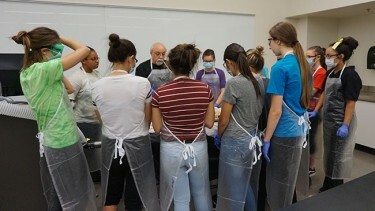 MET students are the first in GCU’s STEM Scholars to study in the University’s cadaver lab. High school students complete coursework in computer science, information technology, algebra, biology, general chemistry and other subjects. “The main goal of STEM Scholars is to encourage high school students to pursue careers in the science, engineering, technology and medical fields,” Sioredas said. In addition to the MET Academy participants, another 25 students each from Alhambra High in Phoenix and Andrada Technical High in Tucson are participating in the program this year. The plan is to create new partnerships and enroll more than 650 students across 10 or more local school districts over the next two years, she said. “We want to get these students excited about a variety of medical fields and see how knowledge that they learn in the classroom is used in professional settings,” Sioredas said. For Christina Patino, a MET Academy senior, the experiment was exciting and fits into her goal to become a neurosurgeon. “I am trying to see how drastic is the difference between our textbook body and an actual body,” Patino said. Patino and several others admitted that at first, they were a little squeamish. But the pure excitement of the learning experience took that away. Ryan Cannon, a GCU anatomy and physiology lab coordinator, said the cadaver that was examined Friday is one of about 16 available for study at GCU. The program has grown from having just six cadavers in 2010, Cannon said. The program also gives students a familiarity with the new engineering building, which opened this fall, GCU’s new STEM programs and other high-level lab opportunities at a University they may be considering for their futures. “I’m really thinking about GCU because it has a great medical program,” said junior Arleth Castaneda. Reach Laurie Merrill at (602) 639-6511 or laurie.merrill@gcu.edu.